Coming Soon: Dendrochronological Data in Archaeology Guide to Good Practice! 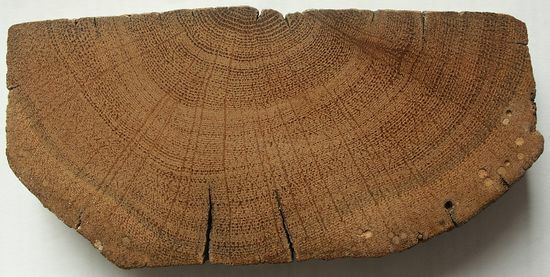 ADS and the Digital Collaboratory for Cultural Dendrochronology are pleased to announce that a new Guide to Good Practice on Dendrochronological Data in Archaeology will be available soon. The guide will provide good-practice guidance for the collection and archive of dendrochronological data in the context of archaeological and historical research. The guide is aimed at both those creating dendrochronological datasets, and those that commission dendrochronological analyses. This guide will not cover the methods involved in dendrochronological analyses, but focuses on how to describe and archive the digital data and metadata involved in these analyses. The guide will be available soon on the Guides to Good practice website, and it’s release will be announced on the ADS website, so keep a look out for the announcement. Old School Cottage, Bayton, Worcestershire: Section of joist with 132 rings (in a distance of 8 cm), 1378-1509 (Vernacular Architecture 27, p. 91). ADS and Internet Archaeology have been integrating ORCID iDs to archives and articles for a while now, and with over 1.3 million ORCID iDs issued we are sure some of our previous depositors and authors have now registered. By telling us your ORCID iD we can link to your ORCID record from our ADS archive pages and Internet Archaeology articles. If you don’t already have an ORCID iD why not register today! Read ADS Director Julian Richards reasons for registering for a ORCID ID here. ORCID provides a persistent digital identifier that distinguishes an individual from every other researcher and, through integration in key research workflows such as manuscript and grant submissions, supports automated linkages between you and your professional activities ensuring that all your work is recognized. In other words, ORCID does for people what Datacite and Digital Object Identifiers (DOIs) do for online resources. It is supported by some major research organisations, libraries, and publishers, including the California Digital Library, CERN, Cornell University, Elsevier, MIT, Nature Publishing Group, Thomson Reuters, The Welcome Trust, and Wiley Blackwell. ORCID is a free service and it is surprisingly easy to register for an ORCID ID. Indeed, it takes about 30 seconds, and then it is equally easy to add information about publications and funded research projects. As soon as you have registered ORCID will use automated tools to make suggestions of publications and data sets drawn from the databases of CrossRef, Datacite, Europe PubMed Central, Scopus and other services. Then don’t forget to tell ADS by emailing help@archaeologydataservice.ac.uk so we can update your records! The appeal of the past? The magic of marvelous sites? Probably all of these together, and still more. Up until 31 July 2015, all European citizens can answer the question and tell us about their idea of archaeology by entering a drawing, painting, photo or video in the European competition “You(r) Archaeology”. The competition is open to all citizens of the EU and includes a special section for children (0-12 years).